Beth M. Ley, Ph.D. & Richard N. Ash, M.D. 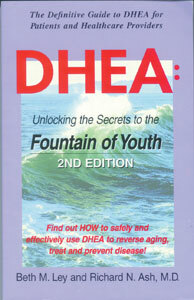 Find out how to take DHEA safely and responsibly... without side effects to end symptoms and reduce risk of osteoporosis, diabetes, arthritis, cancer, heart disease, autoimmune diseases, memory loss, fatigue, sexual problems, PMS, menopause. Lose weight, reduce stress and much more!